A delivery driver has been caught on camera helping himself to some of the food he was delivering while waiting for the customer to come to the door. 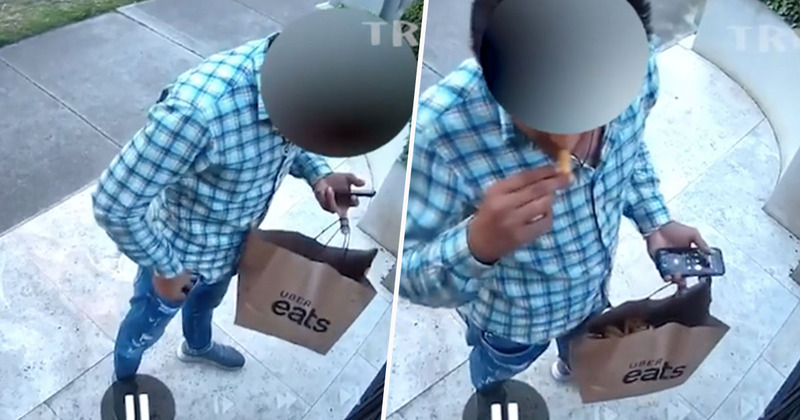 The UberEats employee was caught on the customer’s CCTV, ringing the doorbell and then scoffing a chip or two. Sneaking the quick bite after ringing the doorbell? The guy is playing with fire. He’s obviously not hungry, he just loves the thrill of it all. The moment was shared by Triple M’s Hot Breakfast with Eddie McGuire. Uber Eats Driver Knocks Off A Chip! Surely this isn't play on?! The incident was captured on a last Monday, September 24, in Melbourne, Australia. This has been a bit of a common occurrence at my place where sometimes the Uber [Eats] comes in and you go ‘it’s a bit light’. Anyway, so a good friend of mine had the home security system going and he said ‘you need to come and have a look at this one, old pal’. Now, if you ask me, the shocking thing isn’t the fact the delivery guy takes a chip. He’s probably working long hours for not a great wage, maybe he saw a loose chip and was a bit peckish? We’ve all been there, and I doubt the customer noticed or minded a single chip had been hastily scoffed by a tired and hungry delivery man. What strikes me most about the video is he did it after he rang the doorbell! The brazenness of it all! He’s obviously doing it for the rush of adrenaline you get in the possibility of getting caught. On the other hand, maybe he’s taste-testing it? We know how important food safety is, and we ask delivery partners to take great care during the delivery process to ensure the quality of meals they deliver for restaurants reflect the restaurant’s standards. Delivery partners using UberEats are expected to comply with the Uber Eats community guidelines which explain they can lose access to the app for tampering with orders. We encourage users of the app to contact us with any concerns or issues they may be having and we will work to resolve these with them. Many viewers could relate to the video, saying ‘me as an uber eats driver’ after seeing the footage. While others didn’t quite see the funny side, saying ‘Don’t know where his hands have been’, and ‘Another reason to stop using Uber eats! Gross’. If they want to avoid this in the future, perhaps the hungry people of Melbourne could take a leaf out of the book of these prisoners in Dublin, who were spotted using a drone to get a Chinese takeaway delivered to them while behind bars. Prison staff were alerted to the situation after finding the empty food containers in the bins of the prison yard. Prisoners apparently formed ‘human pyramids’ to reach up and grab the contraband through the nets that cover the yard.